The Proof is in the Pudding; “Above and Beyond” are the 2 Main Ingredients. School is starting everywhere. The Lexington School started yesterday. Fast forward very quickly, which is how it feels, and imagine your child going away to college. That’s the reality for TLS class of 2012. Seems they just walked the commencement stage at Scarlet Gate, but here they go again. We aren’t worried about them; instead we watch with anticipation of all the great things they’ll do for this world. Ask anyone; Lexington School grads are well-rounded individuals who love to learn, know how to work, and simply put, are confident in any academic or athletic setting. They have the will and the courage go ABOVE and BEYOND. 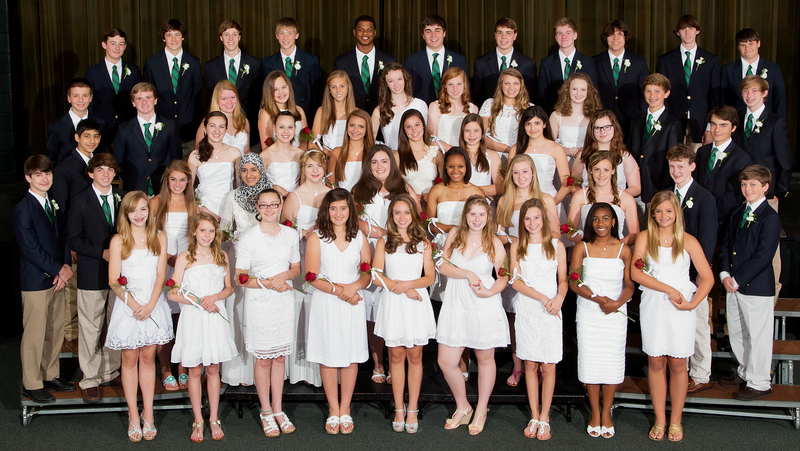 Proof is in this TLS class of 2012. You’ve heard about a few of them already from “Alumni Spotlights” last Spring. But there are roughly 50 graduates from this 2012 class who have won acceptances and prestigious scholarships to colleges all over the country (see matriculation list). As a group they are proof in the pudding that is The Lexington School foundation. As a featured update, three of those students, Eliza Jane Schaeffer, Stevan Kriss, and Clara de Castro went on to represent their classmates as Salutatorian and Valedictorian at their respective high schools. To be clear, that’s no small feat. TLS graduates represent fewer than 1% of their age peers in Fayette county. Eliza Jane competed with roughly 600 graduates at Henry Clay High School; Stevan graduated at the top of over 200 students at Lexington Catholic. They addressed thousands of people at their commencement ceremonies. These were impressive honors, but those moments were the culmination and the start of a much larger story that includes generations of Lexington School graduates, past, present, and future. Stevan, Eliza Jane, and Clara are not just academics; they are the complete package. Salutatorian at Henry Clay High School, Eliza Jane will continue her studies at Dartmouth University. Let’s start with Eliza Jane. Already her resume might be as long as Margaret Thatcher’s, so here are few highlights: National Merit Scholar, Governor’s Scholar, Youth Governor of Kentucky, National Honor Society, Dartmouth Book Award, Presidential Scholar, Henry Clay Faculty Cup, and so, so much more—count them; over thirty academic awards on her resume followed by presentations, publications, service…the list is too long to type. Awards are one thing, having the courage to lead is something different. 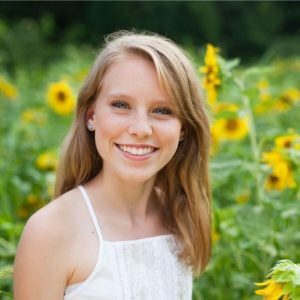 As committee chair of student governance for the Pritchard Committee, Eliza Jane drafted a bill in the Kentucky State Legislature that would allow districts to add a student member to their superintendent screening committees. She organized a 300-person “Stand With Students” Rally to respond to the amendments. She was interviewed on Rachel Maddow Show, mentioned in the Washington Post, New York Times, Associated Press, Huffington Post, and local papers. She crafted a cohesive message and communication strategy, met with the legislature and prominent community members, and convinced institutions to endorse the legislation. There’s more. Bold leader, academic wiz, Eliza Jane also runs hard and fast; literally. She is an outstanding Cross Country athlete. Three-time Academic All-State Track/XC, Eliza Jane successfully competed against very fast kids. Just this year she was awarded KHSAA Girls Cross Country 3A Above and Beyond Award. That award tells the Eliza Jane story, the one where her intelligence AND drive, her desire to learn and perform, are the character traits that will continue take her above and beyond, not just at Dartmouth, the next step on her journey, but well into what will be an exciting, impactful future. We’ll be watching. Valedictorian at Lexington Catholic High School, Stevan will play lacrosse and continue his studies at Washington and Lee University. Now Stevan Kriss. Scholar athlete. Valedictorian at Lexington Catholic High School and lacrosse star. Let’s start with a few of Stevan’s lacrosse accomplishments: two-time US lacrosse high school all-American and academic all- American, three-time high school all-state, two-year high school varsity lacrosse MVP, breaking six school lacrosse records. There’s more: He was selected for the 2016 USA JR National U18 indoor lacrosse squad and played internationally this summer. 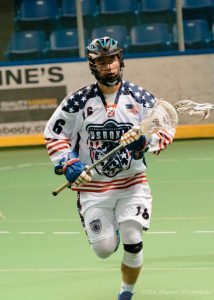 He competed in the 2015 World Championships for indoor lacrosse in Syracuse, New York, and was selected for the World U20 All-Star team. Stevan will be heading to Finland in summer 2017 to compete in the European indoor lacrosse championships. Academically, you can imagine Stevan’s resume as well. Countless awards and accomplishments. National Merit Scholar, National Honor Society, AP Awards; draped in academic bling, Stevan stood number one, Valedictorian, at graduation and told some of his story. He left this part out, but it’s something you should know: Stevan submitted his Exemplar project “Abusive rib fractures in infants and children: Does perpetrator handedness matter?” to the Google International Science Fair, a global competition of the best scientific projects for high school students in 2016. Out of thousands of applicants from around the world, there were 100 total winners, 30 from the Americas. Stevan’s Exemplar project was one of the 30 winners from the Americas. This Exemplar science project was also accepted for a podium presentation at an international medical meeting in Chicago in May 2016. When he’s not presenting at national conferences or playing national and international lacrosse, you’ll find Stevan at Washington and Lee University where he’ll be leading in a new realm; more of the same but always ABOVE and BEYOND. 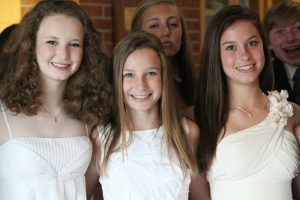 Here’s Clara (far left) at 8th grade graduation with friends. And then there’s Clara de Castro, Valedictorian at Sayre School, another extraordinary TLS graduate.Clara de Castro ’12 has studied science since she was in Kindergarten at The Lexington School. Her passion for science certainly paid off. Not only did she receive the Presidential Scholarship at the University of Chicago where she currently attends, but also Clara was accepted to Columbia University where she was selected to be a Rabi Scholar. There are 10 Rabi Scholars a year and they represent the top 10 students in science for that year’s applicants. Anyone who knows Clara knows that she takes it all in stride, but everyone knows that she’s taking her talents to Chicago where she’ll make huge strides there and for years to come. “Above and Beyond” is the theme of #1 and #2, Valedictorian and Salutatorian. It’s Eliza Jane, Stevan, Clara and the entire TLS class of 2012. These stories are proof of the pudding that is The Lexington School foundation; above and beyond are the two main ingredients. Congratulations to Stevan, Eliza Jane, Clara and all of the amazing 2012 Lexington School grads, now 2016 high school graduates. You have accomplished so much already in your individual ways. Keep up that COURAGE and CURIOSITY, and you’ll keep making that difference. You forgot to mention that her dad also is a TLS alum! Great to see Smith College. Tucker’s sister went to Smith.